I played soccer growing up. I was in great shape through my college years and then joined the workforce and it all went downhill until 2 ½ years ago. I actually met Brooke Schupp and she suggested I try (there was a beginner class starting in about a month from that date). I loved it. I never could get myself to be consistent just going to the gym. This was enough variety that it keeps me wanting to come because I never get bored. I have lost about 25 pounds. My endurance has increased significantly (even though I still have a long way to go to “get in shape”). I have been able to reduce my blood pressure medication to a very low dose. I have been able to go snow skiing with my family, which I never would have done before 2 years ago. I just feel better! 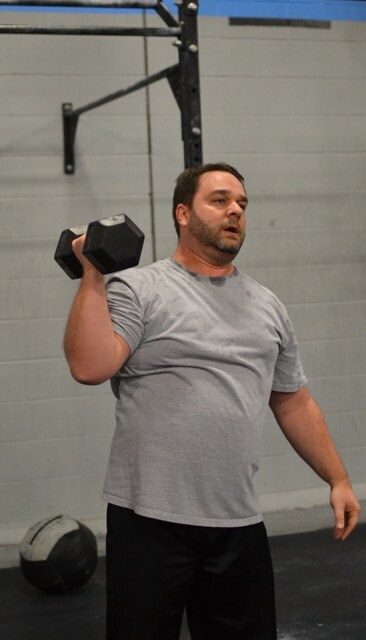 What is your advice for people getting started or thinking abut starting Crossfit? Do it! Hang in there! You will be sore like you’ve never been sore before, but it’s worth it. I love golf. I have several rent houses. We have started snow skiing again. We have a 17 yr old and an 11 yr old. I have been married for 25 years.